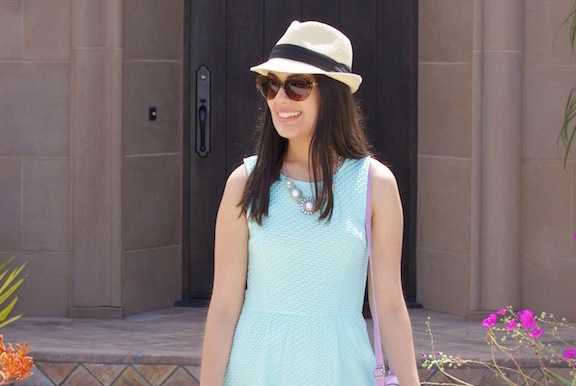 This California girl is known for her effortless and colorful outfits. Jess is the voice behind Blush Confetti, a space where she documents her personal style. Read on to find out where she draws her inspiration from and the one store she could spend serious time browsing. I would describe my personal style as effortless, feminine and colorful. I believe in having fun when it comes to styling and like to incorporate crisp color, darling details and playful prints to my outfits. Everything around influences me, but traveling would probably be my favorite source of inspiration. Every destination has hidden gems that spark new ideas and encourage you to be creative. What has been your favorite experience about running a blog? My blog has opened up many doors to amazing opportunities. My favorite experiences have been meeting wonderful creatives and attending special events hosted by brands I love. Without a doubt, spring! It’s a time of renewal – it feels so good to get outside after a cold winter and see nature reawaken. Picking up fresh flowers from the market and adding color to my closet are some of my favorite perks of the season. What’s one store you could spend hours browsing? It would probably be Anthropologie. They have curated a beautiful, whimsical space and carry everything I love: clothing, home décor, stationary, books and accessories.